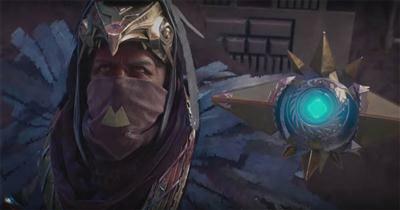 With every new raid comes a collection of raid weapons and with Wrath of the Machine this is no different. Every Destiny fan knows that Raid weapons are highly sought after weapons thanks to their high light levels and the unique perks that are tailor made for the raid's hard mode. 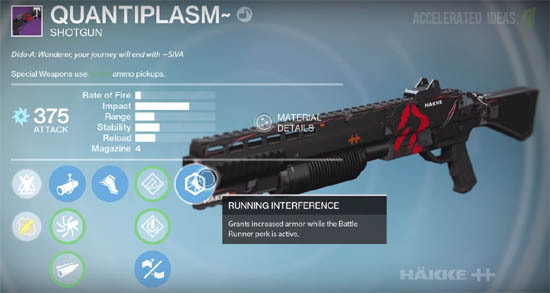 As most of you will know, the Raid weapons are usually split between the Normal and Hard modes of the raid. 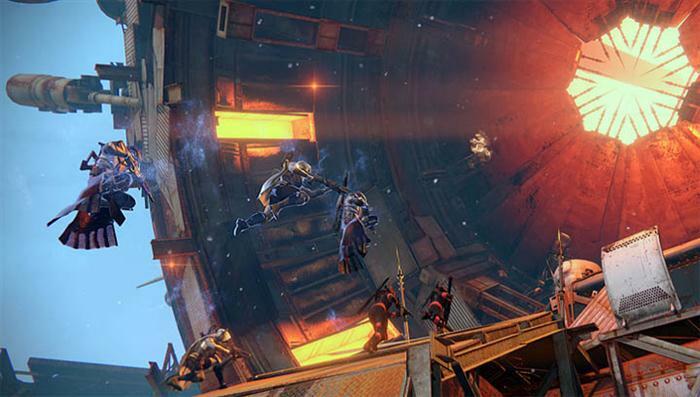 Bungie have once again released the Normal mode of the Raid before the Hard version. You can expect to find the "lesser" (if that's the right word) weapons in the Normal raid and the more sought after weapons in the Hard mode. Checkpoints are the standard place to find Raid weapons with the better weapons being rewards for mini-BOSS kills later in the raid and the best of the crop turning up following the final BOSS kill. In total there are ten new raid weapons, one weapon covering each of the types e.g. Hand Cannon, Pulse Rifle etc. Each of the Raid weapons comes with the Whirlwind Curse which does bonus damage against Fallen - perfect for the Raid encounter! Note: Images below will be replaced with full size images once these magnificent weapons are discovered. Coming packed with the Reactive Reload perk, this Hand Cannon gains bonus damage following a successful kill and reload, which in turn also rewards increased agility through the Quick Reaction perk. Fever and Remedy comes with a stock of 11 and basic kinetic damage output. It's tagline is: Judith-D: ~consumption~ strongly encouraged. Note: Hard mode only drop. Ex Machina comes with both Spray and Play and Wait for It perks which increase the reload speed of the weapon when the mag is empty and also grants a larger than usual magazine when reloading on an empty mag. The Zeal Vector weapon also comes with similar perks to Ex Machine in that is has Spray and Play and Wait for It, both of which improve the weapons prospects when the mag is fully empty. It has a mag size of 15. This weapon's description reads: Pryderi-D: Long will ~replicate replicate replicate replicate replicate rep. 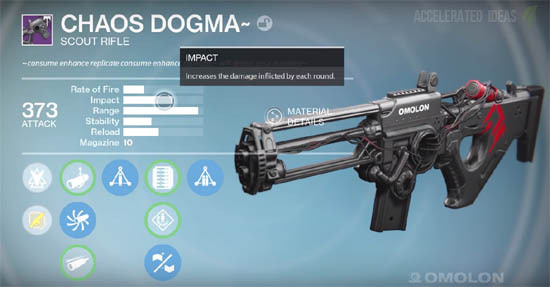 Chaos Dogma is an interesting Scout Rifle that like any good rifle strongly rewards precision hits. Two of its main perks called Triple Tap and Triple Double essentially mean that rapidly landing precision hits will return one round to the magazine and also transfer an additional bullet from reserves to the magazine. Tagline reads: CHAOS DOGMA~ - ~consume enhance replicate consume enhance replicate~ will drown your enemies. The Quantiplasm is an agile Guardian's best friend. Again, two of it's main perks work in tandem. Labelled Battle Runner and Running Interference, the perks will increase the players sprint speed following kills (Battle Runner) which is then furthered by increasing armour for the duration of the first perks activation (Running Interference). 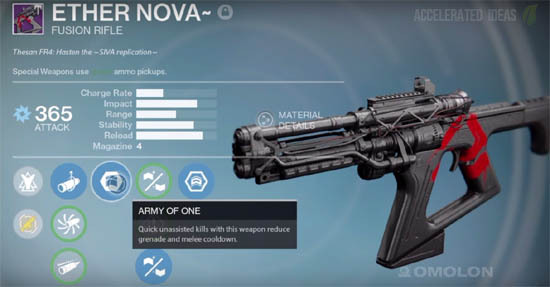 Army of One and Two for One are the main perks for Ether Nova. Again working in tandem, Army of One firstly increases melee and grenade cooldown following unassisted kills which in turn is improved twice as much by Two for One ,essentially doubling the rate of cooldown. Not bad! Although maybe not as glamorous as the Iron Gjallarhorn, Sound and Fury does have two interesting perks on it's side. Spray and Play and Wait for It are both empty mag related perks. These together will improve reload speed and grant a larger than normal magazine size following a reload from an empty mag. A great tagline: replicate caution replicate overheating replication destabilization imminent~ SUROS. Coming with Triple Tap and Triple Double, this weapon is similar to Chaos Dogma (Scout Rifle) with the notable exception that achieving precision hits with a machine gun doesn't sound too promising!? 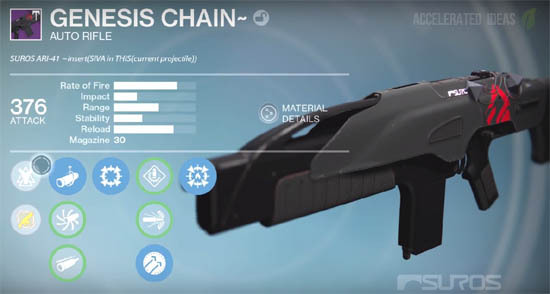 Everyone loves a good primary and these days Hand Cannons have long overtaken Auto Rifles, so what does Genesis Chain have going for it? Well, it's two main perks are Focused Fire and Focused Firefly. The first of these perks offers a slower firerate whilst zoomed but with additional damage, whilst the second perk is the well loved Firefly that causes targets to explode when the first perk is active. Like the Pulse Rifle from The Dark Below, Steel Medulla comes with the Full Auto perk meaning that holding down the trigger will cause endless pulse bursts. It's other notable perk is Sign of Four which causes additional damage from the fourth burst following three successive burst hits on the same target. Another great tagline: replicate~ devastate your foes ~consume~ Herja ~repeat.